Change the way your station behaves at the end of a scheduled playlist. 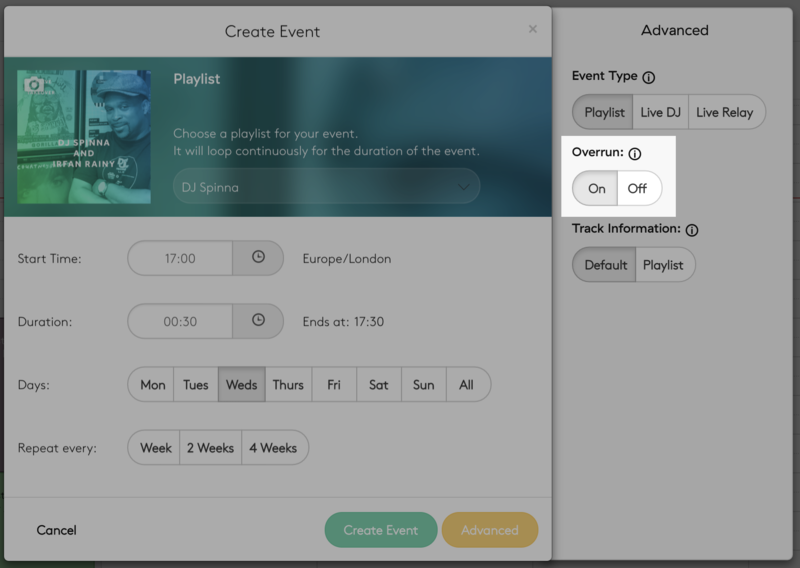 A currently playing track at the end of a playlist will continue playing so it's not interrupted by the next event when Overrun is enabled. Add an event overrun to any scheduled playlist by going to Advanced > Playlist and switching on Overrun. When you have two playlists back to back and the overrun feature is enabled on the first playlist, the current track will continue to play from the first playlist and will not get cut off by the second playlist starting. The track will be able to finish and will fade nicely into the second playlist rather than being cut short. When you have a playlist scheduled with a Live Event scheduled after it. Overrun will automatically be disabled so you don’t have to wait for the track to finish. A Live DJ can connect at the time specified and won’t have to wait for the track to finish before they can begin their broadcast. Radio.co used to enable Overrun by default in this scenario, however, we have since modified this behaviour so that the playlist will only have Overrun applied if set in the event.